The surgical robots market comprises several stakeholders such as surgical robots and related device manufacturing companies, suppliers and distributors of surgical robots, hospital and diagnostic centers, ambulatory surgery centers, medical colleges, teaching hospitals, and academic medical centers. Various primary sources from both, the supply and demand sides of the market were interviewed to obtain qualitative and quantitative information. Following the breakdown of primary respondents. After arriving at the overall market size using the market size estimation processes as explained above the market was split into several segments and subsegments. In order to complete the overall market engineering process and arrive at the exact statistics of each market segment and subsegment, the data triangulation and market breakdown procedures were employed, wherever applicable. The data was triangulated by studying various factors and trends from both, the demand and supply sides, in the surgical robots industry. To track and analyze competitive developments such as product launches & approvals, acquisitions & expansions, partnerships, agreements & collaborations; in the market. Intuitive Surgical (US), Stryker Corporation (US), Mazor Robotic (US). Major 10 players covered. This research report categorizes the market based on component, application, end user, and region. The market for surgical robots is expected to grow from USD 3.9 billion in 2018 to USD 6.5 billion by 2023, at a Compound Annual Growth Rate (CAGR) of 10.4% during the forecast period. 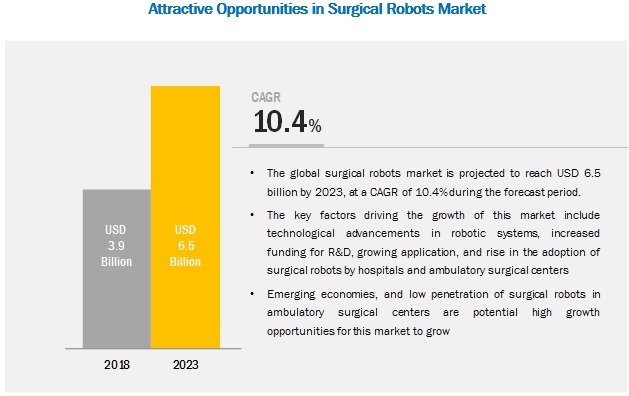 Growth in the surgical robots market is primarily driven by factors such as introduction of novel product and technologies in the market, increased funding for R&D, growing application, and rise in the adoption of surgical robots by hospitals and ambulatory surgical centers. The recurring purchase of instruments and accessories for every procedure owing to their disposable nature will significantly boost the demand for consumables. The increasing preference for minimally invasive robotic assisted surgery is further expected to fuel market growth. The increasing adoption of surgical robots by hospitals is further expected to offer growth opportunities. Surgical robots are being used in the areas of bariatric surgery, Heller myotomy, gastrectomy, hernia repair, cholecystectomy, Nissen fundoplication, transoral surgery, and pancreatectomy, among other general surgeries. The growth in the number of these procedures is likely to fuel market growth. The use of robotic surgeries for various application areas has also grown due to the advantages of minimally invasive techniques; as compared to the large incisions required in traditional surgery, robotic surgeries can reduce pain and recovery time for many patients. Hospitals are using these surgical robots specifically for procedures such as prostatectomy, hysterectomy, hernia repair, cholecystectomy, colon and rectal procedures, nephrectomy, sacrocolpopexy, mitral valve repair, and transoral robotic surgery. However, companies are now focusing on developing miniature sized and less expensive surgical robots to target smaller hospitals and ambulatory surgical centers. Factors such as the development of advanced surgical robotic technology, increasing adoption of surgical robots, government initiatives, and the availability of funding are driving the growth of the market in North America. The adoption of surgical robots at ambulatory surgical centers is expected to offer growth opportunities for players in the market. The major vendors in the global market are Intuitive Surgical (US), Stryker (US), and Mazor Robotics (US). These companies have the largest installed base of surgical robotic systems across hospitals and ambulatory surgical centers. Other players involved in this market are Smith & Nephew (UK), Hansen Medical (US), Medrobotics (US), TransEnterix (US), Medtech (France), Renishaw (UK), and THINK Surgical (US). In 2018, Intuitive Surgical announces the launch of Single Port Platform. This system is indicated for urologic surgical procedures that are appropriate for a single port approach. In 2017, Stryker received US FDA approval for its cementless Mako Total Knee with Triathlon Tritanium. In 2016, Mazor Robotics entered into a two-stage agreement with Medtronic to enable product co-development and co-promotion. Which of the product segment will dominate the market in future? Emerging countries have immense opportunities for the growth and adoption of surgical robots, will this scenario continue in the next five years? Low sequencing costs in the emerging market is impacting the growth for developed markets. How will pricing difference impact the overall market? What are the upcoming technologies in the market?